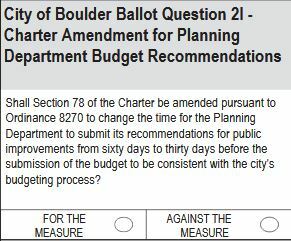 Question 2I would amend City Charter section 78, to incorporate changes regarding the timeline for the city’s planning department to submit yearly budget recommendations. Under current Charter language staff interpretation, the planning department (now known as Planning, Housing and Sustainability) must submit its capital improvement program (CIP) recommendations 60 days before the first public hearing on the yearly budget. Under 2I, the 60-day requirement would be reduced to 30 days. Passing 2I would give the city’s planning department and planning board more time for input and recommendations from other departments and boards before finalizing budget recommendations. Other people involved in the budget process would have less time to evaluate planning department recommendations before the first public hearing on the budget.